Today did not start well. At 1am we get to Orly Airport intending to camp there until our plane leaves at 7.20am. No way can we get in the airport is locked up tight and there are just a few stranded souls standing outside looking forlorn. We hail down a cab and he takes us a short distance to a nearby Ibis Hotel and assists us to book in. We are dog tired after the last couple of days and would have slept anywhere. So when the iPone alarm did not work and I woke up at 6.00 am there was a further rush to get dressed and drag our bags to the airport. A bit hectic when you don’t really know where the airport is and in any event there seems be a massive construction site between us and the planes we can see in the distance. No cabs at this hour so we pick our way along a poorly marked path through the construction debris. We had never used Easyjet or any discount air travel in Europe before so there were a number of things to learn. First book your bags in when you get the tickets otherwise luggage costs E30 per bag instead of E15. Next you can only have one piece of carry-on even if it is just a handbag so we are left frantically trying to stuff hand luggage into 2 bags whilst the bemused, experienced discount French travellers look on . Next there are no reserved seats so if you want to sit with anyone in particular get on early. Anyway it is a rapid learning curve and before long we are airborne and heading for Venice. Fantastic view of the French/Swiss/Austrian alps as the sun rises. Soon we are landing at Venice airport and the next adventure is getting to the house we have booked for the next 2 days. Nicola our host sends sms instructions and so we take the Water Bus which is slow as it stops at all stations but somewhat calming after the hectic last couple of days. 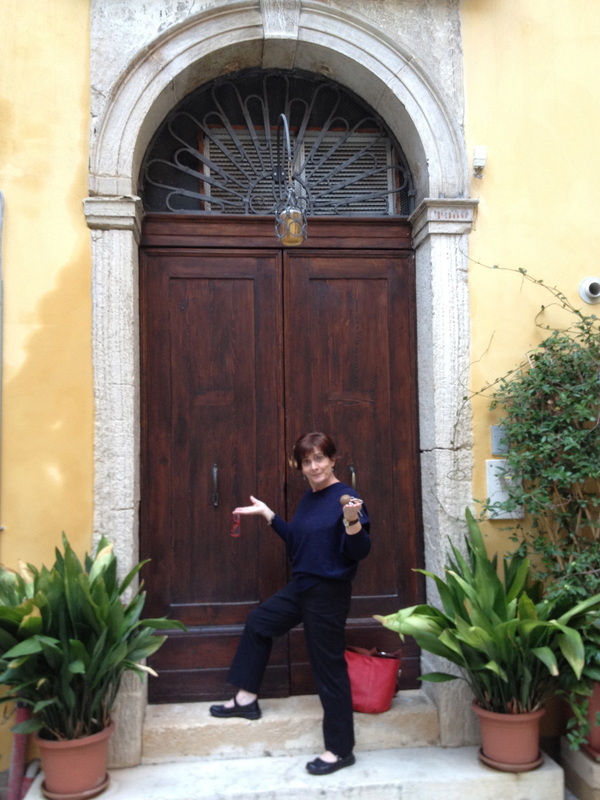 Our host, Nicola, meets us as we leave St Marks Square and shows us his lovely house. More about that later. We unpack and have a soak and put on some fresh clothes which makes me feel a lot better. We go for a walk and Margie does some shopping. She is shedding her old image and bit by bit adopting a new persona. That night we book at the restaurant about 60 m’s away recommended by Nicola. 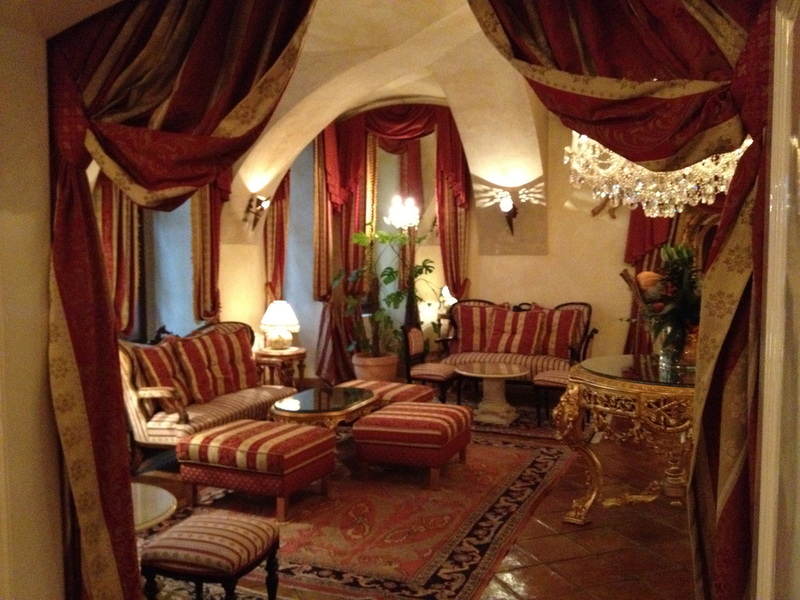 The Bristro de Venise……It is fantastic. I have squids ink spaghetti with hunks of squid. Margie has ravioli. Then I have the calve’s liver with onions and she has duck. We finish with a crème brulee and tiramisu. We have 6 individual glasses of wine plus an amuse bouche and a pre dessert chocolate. More about this wonderful meal later. We are better after a good sleep. Nicolas house is amazing but there are no provisions. Luckily we bought coffee yesterday. Today we first plan to go the market. We are looking at markets of the world and after Hong Kong and London it will be interesting to see how Venice compares. The Markets just over the Rialto and near where we had a very nice lunch just beside the Grande Canal yesterday. 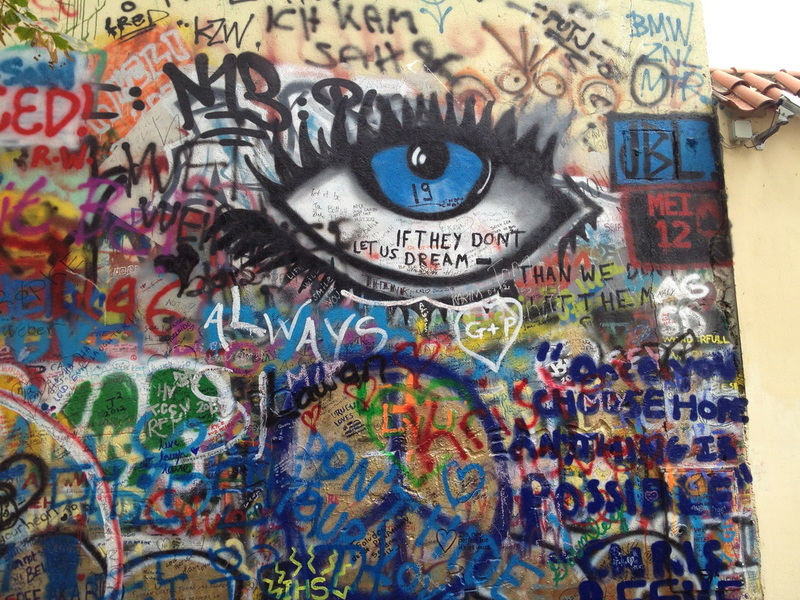 At first here does not seem to be much to see or buy but as we walk on we see that they go on and on. There is fresh fruit and vegetables. The quality is generally good although there is obviously less emphasis on the polished appearance of fruit and more on its taste. (Interestingly I read an article in England where one commentator was saying that English apples looked horrible this year but tasted much better than usual. I had a couple of apples in England and I thought they were soft and approaching floury). Chillis are sold in bunches like flowers and there is every type of fungi (mushrooms) that you can imagine. Pomegranates and persimmons are also popular. There are sea creatures of every kind. If you can catch it, net it, dredge it up or scrap it off a rock the Italians (and especially the Venetians) will eat it. Marlin, swordfish and shark down to sardines, crabs, scallops and mussels. There are many types of fish with which I am totally unfamiliar. There are also shellfish which resemble the goose neck barnacles which we had first encountered in Hibiscus in London. It’s a great pity that we are not going to be here for a while. I would love to do some cooking with the produce here. Especially as you can buy every type of fresh and tried pasta and cheese from ricotta through to parmigarno grando. After the markets have a brunch of fresh berries and set off to search for some Titians that are located in a Friary nearby. Nicola gave us some directions and we have a map but its still not easy to find your way. The old city is a maze of narrow alleys interspersed with canals and nothing is either straight or circulars but a bit of both. 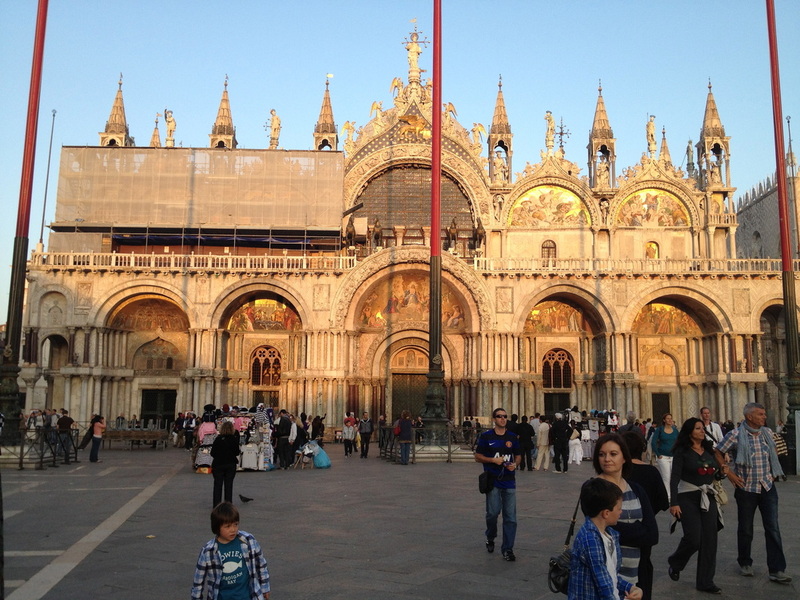 Eventually we find The Santa Maria Gloriosa Dei Frari. Here there are two important Titan painting. There is also a magnificent Bellini. We are blessed with glorious weather. 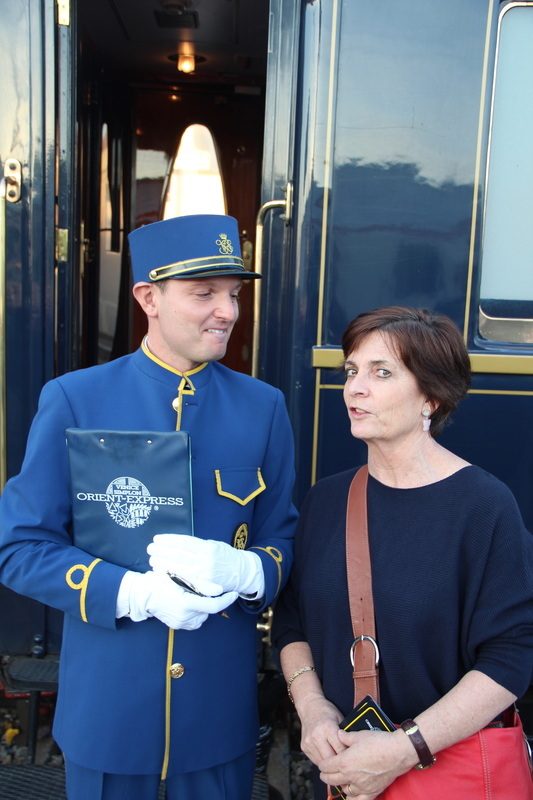 This afternoon we are boarding the Orient Express. It is pretty painless. 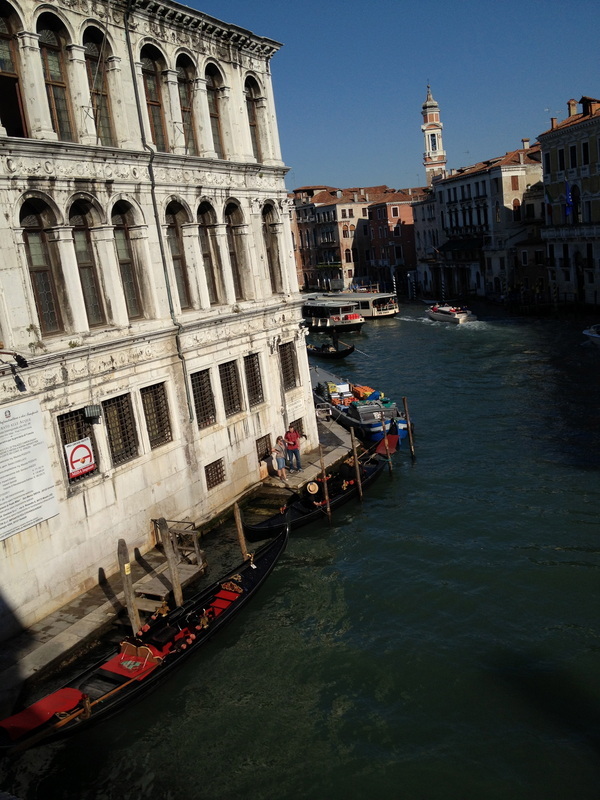 Just take the Vaporetto to the Venice Railway Station. A 15 minute cruise on the Grand Canal. 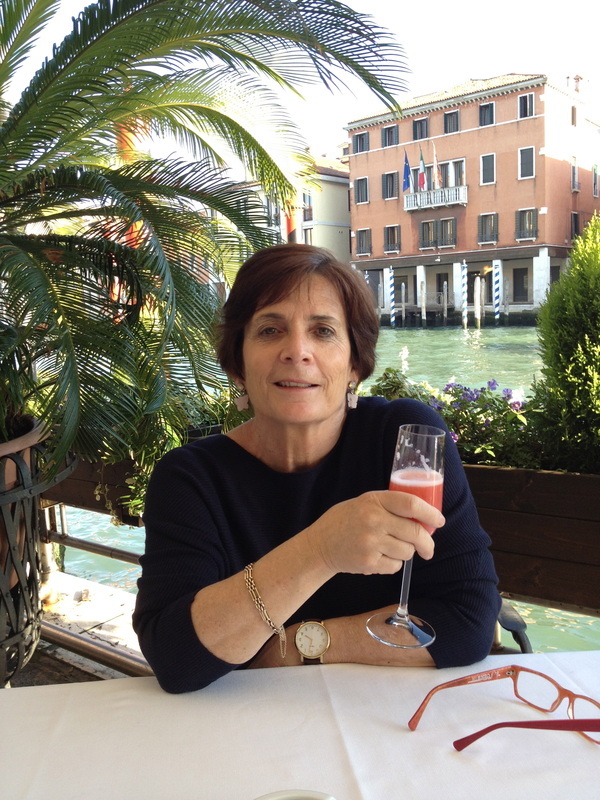 Then we book in and a very lovely young lady leads us a short way to a Hotel balcony where we have a cocktail and canapés whilst watching the traffic pass on the Grand Canal. A short time later we have boarded underway. Thanks to Micail, the steward, we have prosecco and some further canapés to see us comfortably on our way. We took the second sitting for dinner as 6.30 seemed a touch early. The French language announcement of the first sitting reminded travellers that the dress for dinner was “chic elegante”. Sounds nicer than “formal”. 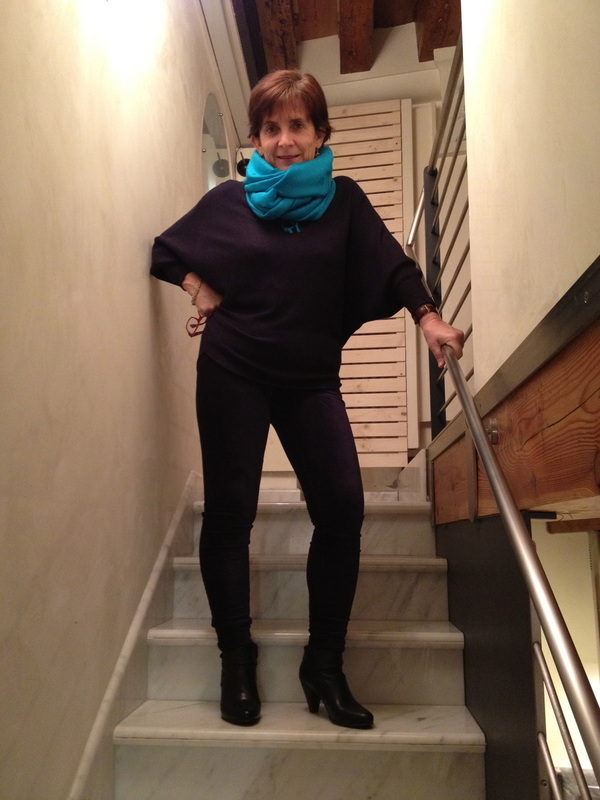 By 8.40 we dressed chic elegante and we make our way to the Bar for a pre-dinner drink. 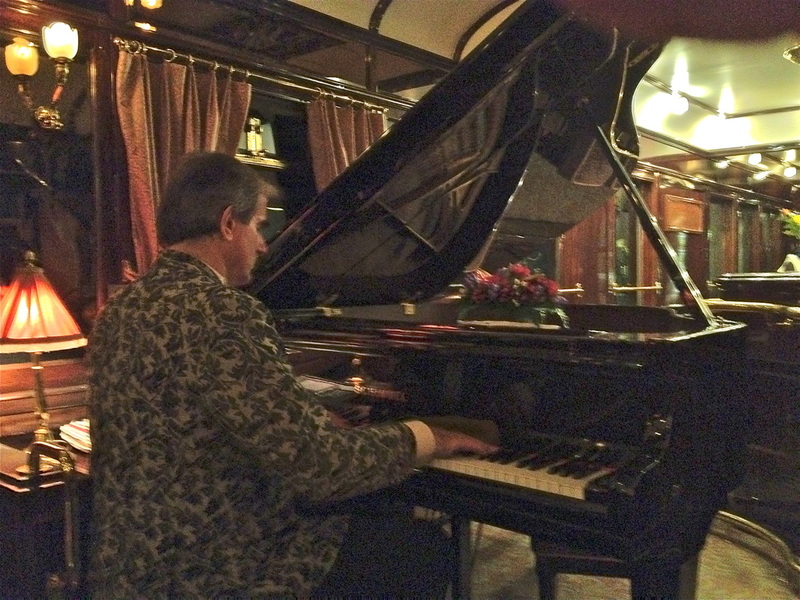 Sam is at the piano and we have a cocktail and meet, Leon & Judith from Colorado and David & Marie from Perth. Dinner is a set menu which you can mix and match with a la carte if you wish. The Beluga Caviar was an extra E410 so we passed on that. In fact the set menu was excellent. First course was a small piece turbot covered in squid’s ink sitting on prosecco flavoured risotto. I have had both the squids ink spaghetti and risotto before and know it is a great combination but this is a new twist. The whole dish is wonderfully constructed. The fish is cooked yet not dry and the risotto is sublime in both texture and taste. The combination of the white fleshed turbot, squids ink and creamy risotto works well. Accompanied by a couple of generous glasses of French Chardonnay it is a wonderful start. Pretty glad I didn’t go for the caviar. Next is Veal wrapped in cabbage and stuffed with kidneys then braised and served with French Brown sauce made slightly sweet by the addition of some mustard fruits finely diced and sprinkled sparingly over the veal. There are a couple of delicate little potatoes and gratin made from creamy chard and Parmesan to round off the dish. Again the presentation is extremely professional and the dish wonderfully balanced in conception and taste. The veal and kidneys is a great combination and the slightly sweet brown sauce reinforces my long held belief that a bit of sweetness in a sauce over meat is a winning move. This course is accompanied by a half bottle of burgundy from St Julian. A lovely wine that is also an excellent companion for the food. We finish off the wine with some cheese served from a large platter with 7 or 8 different choices. No mass of greenery, dried fruits, strawberries and other villains that usually accompany such an offering elsewhere. Just a lovely bunch of fresh cold black grapes on the table and a small spoonful of chutney. To my eternal delight the cheese has had a good time out of the refrigerator and is warm, soft and creamy not chilled and hard as is often the case. We are starting to hit the wall and dessert is still to come. Dessert is a Caramel Crème creation, sweet and delicious but challenging at the end of such a meal. Really should have done more training for this. We finish off with a couple of Amaretto’s in the Bar where the grand piano is still tinkering and Dave, Marie, Leon and Judith join us in the night cap. Outside northern Italia and Austria flash by. Its well after midnight by the time we get back to our cabin and there is the unique experience of sleeping on a train. We spend the morning on the train and have lunch before arriving in Prague. Lunch is again a major production. The starter is a mushroom soup with ravioli stuffed with mushrooms and foie gras. The soup has the most intense mushroom flavour I can remember and the ravioli with the foie gras is sumptuous. Next course is salmon with a sauce crème fleurette. Dessert is again a caramel covered on a thin but crisp biscuit. If we were on this train for a week we would definitely need to go to the fat farm for a month. Not long after lunch is finished the train pulls into Prague and we are disembarking. After a bit of interesting banter with some local boys who are making some extra money helping passengers with their bags and to procure taxis we are off to the Hotel Alchymist. The Hotel itself deserves a special mention. 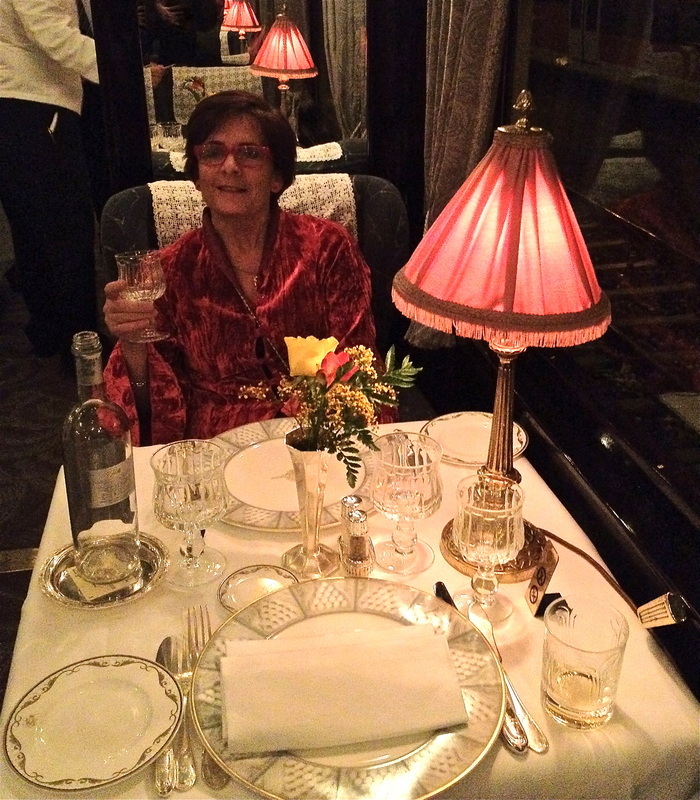 First the service here is first class and as attentive as one could possibly want. Upon arrival we were shown to a chair in the ornate lounge and Mohamed, who I suppose was the day manager, took us through all the attractions of the hotel and the things we could do in Prague. It was a very nice introduction not to mention quite a good sell. Here a very good breakfast is included in the price. In addition the re is free wine and cheese every day at 5.30 in a lounge near the restaurant. We have a room on the second floor and there are a number of lifts and staircases. The original hotel building is perhaps 500 years old and the ceilings are fan vaults. The furniture is ornate rococo. Prague thinks of itself as the centre of baroque style and I assume the hotel is doing its best to live up to the lavish ornamentation of the period. 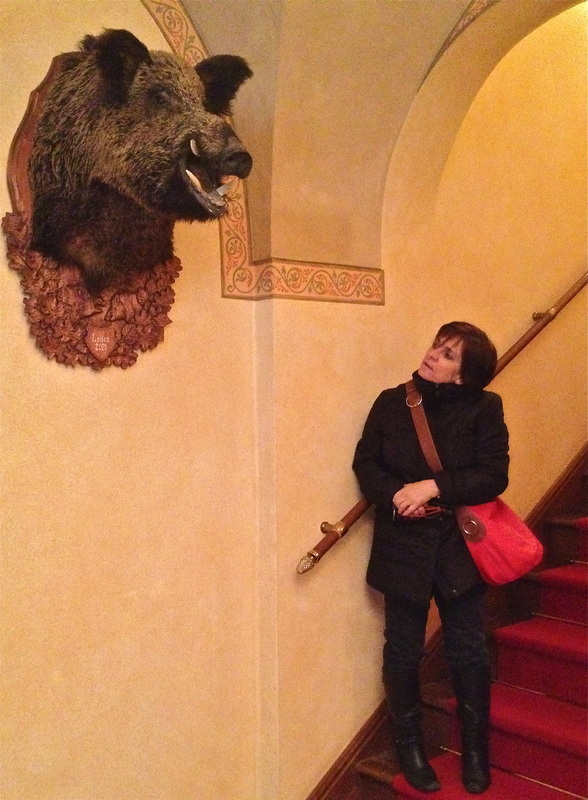 In addition there are some interesting wall mountings to remind us of the hunting traditions of this part of Europe. The most impressive is a massive tusker (male pig or boar) which looks as fierce now as he would have been in life. 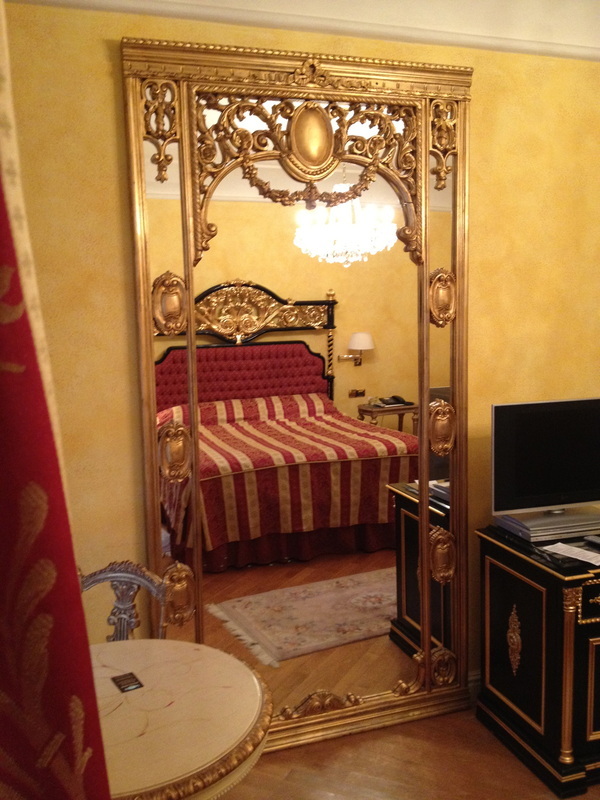 Our room was large with a separate entrance and an ornate 3door wardrobe and massive bathroom with a good deep bath. The bed is a king sized model with an impressive painted bedhead. 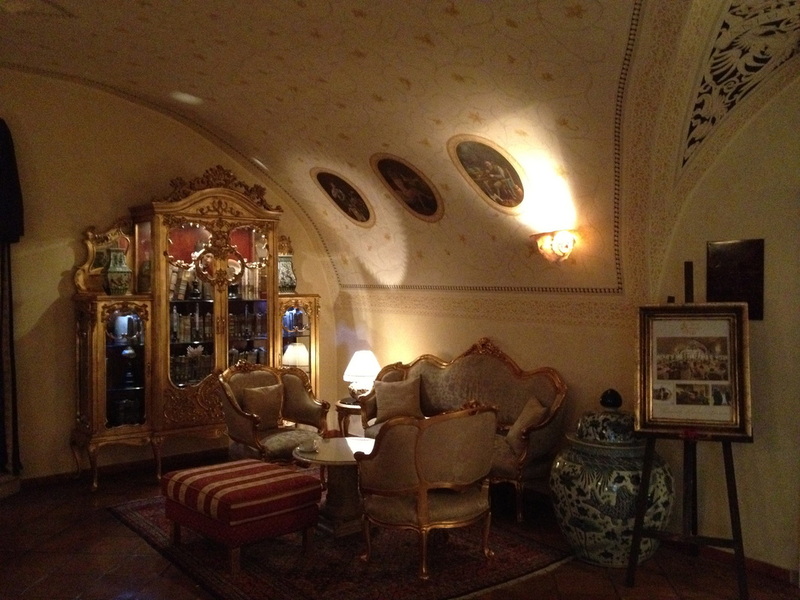 There is also a massive ornate gilded mirror that made the room look even bigger. 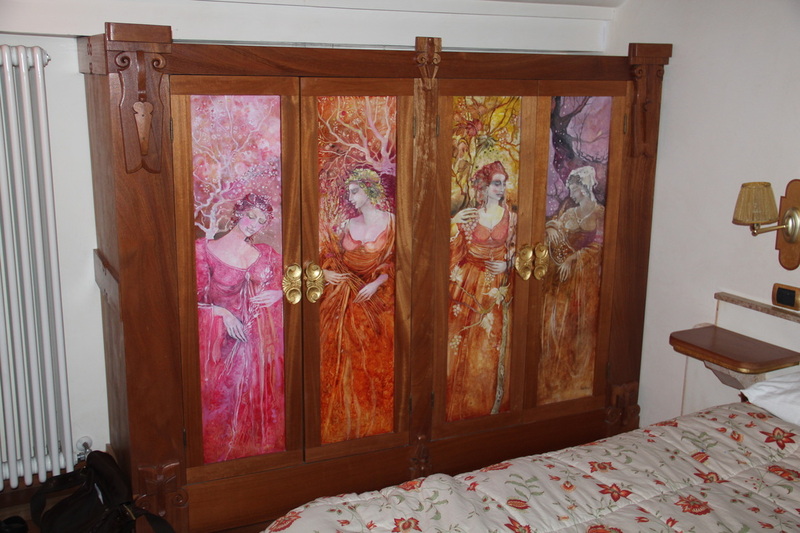 In addition there was an impressive chest of drawers that could well have passed for a valuable antique. Who knows perhaps it was. All this for the price an Ibis or Novatel back home. 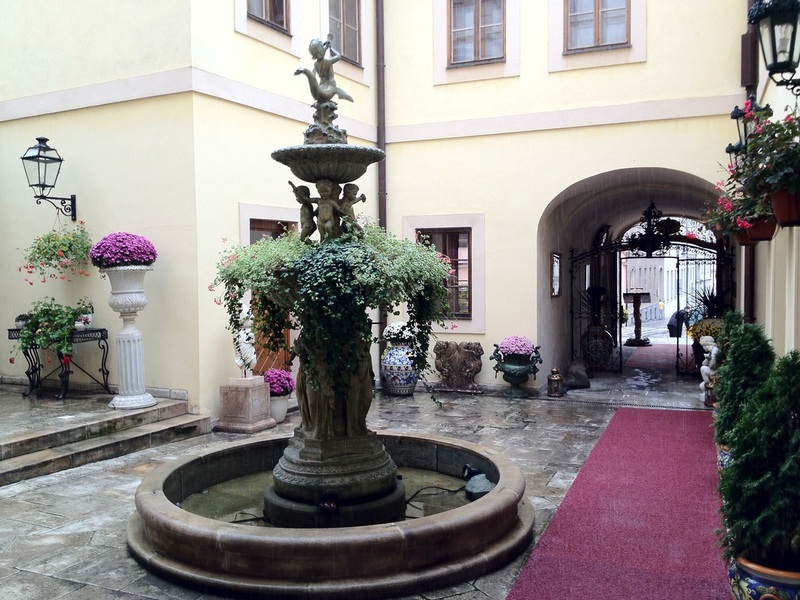 I would really recommend this hotel to anyone going to Prague. We this is our first full day in Prague and we have arranged to take a Private guided tour with David & Marie from Perth. They are a nice couple and are staying at the nearby Alchymist Hotel Residence just a block or so away. · In 1419 some Hussite radicals hurled the hated members of the Town Council from the windows of Prague Castle. Later on 23rd May 1618 Bohemian Nobles burst into Prague Castle and threw 2 members of the Pro Habseurgs group out the window of the upper floors of the castle. Those hurled from the castle survived as a consequence started what is known in Europe as the 30 years war. These events give the world the word “defenestration”. · The coronation crown jewels of the Czech Republic are kept in a locked room in the Church of St Vitas which is within the Castle complex. The room has 7 keys and each key is held by a separate person. The room is opened only for a coronation or otherwise once every 5 years and the 7 key holders gather for the event. The Nazi Governor Heinrich wanted to see the jewels and so the Czechs arranged for the room to be opened. He was impressed with the Coronation Crown and wanted to try it on. His Czech minders advised him that if anyone who was not a true king put the crown on his head he would be cursed and death would follow. Despite the warning Henrich tried on the crown. Some short time later he was killed by the Czech Resistance. · Saint Vitas was martyred in the Xth Century. He was lowered into a vat of boiling oil and when he was pulled out his body was shaking violently ( not all that surprising really). His Christian followers said he was “dancing” and so we have the St Vitas Dance which is a medical condition involving uncontrollable shaking. 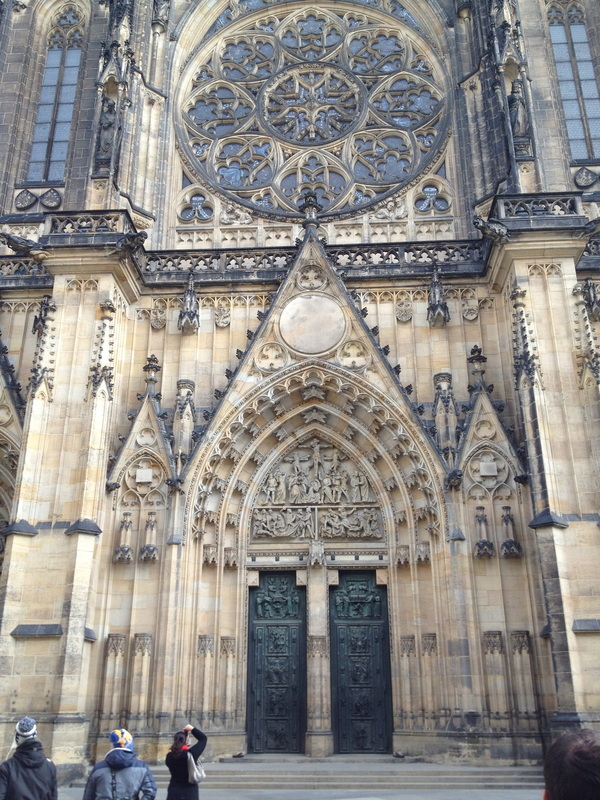 St Vitas’ shoulder blade is supposedly entombed in the Church that bears his name in the grounds of Prague Castle. The possession of such an important religious relic was of great importance in medieval times and bought fame and prestige to the Church and so the Castle and the City. We also visit the Lenin Wall a remnant of the time before the Berlin Wall came down. The tour is 3 hours and E50 each. Good value. 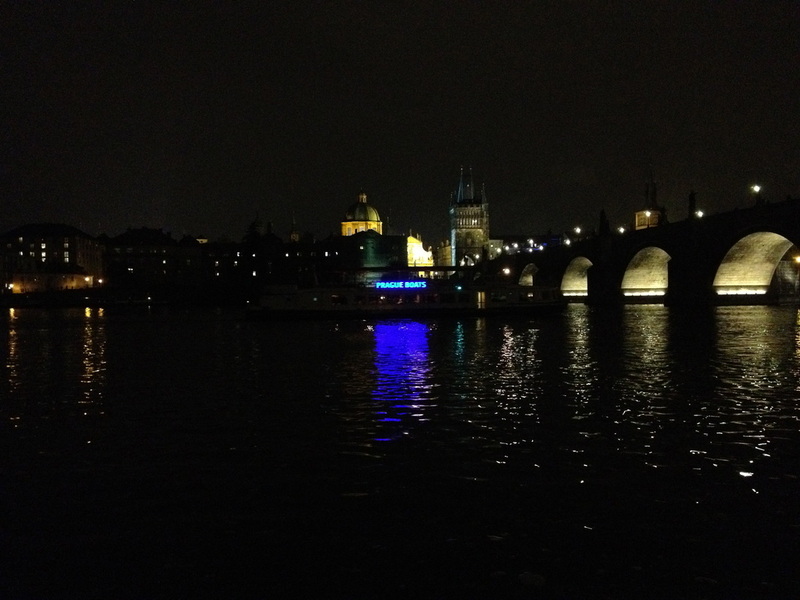 That night we go to one of Prague’s top restaurants Kemp Park on the banks of the river in the shadow of the famous Bridge. The setting is lovely and we get a table by the window looking across the River to the old city. The river boats drift pass with their lights ablaze and the towers of the Cathedrals of the old city twinkle across the expanse of the river. Karol had said this is where the rich and famous eat. Tom Cruise had inhabited the place often during the 3 months he was in Prague for the shooting of the latest Mission Impossible movie so we have reasonably high expectations. 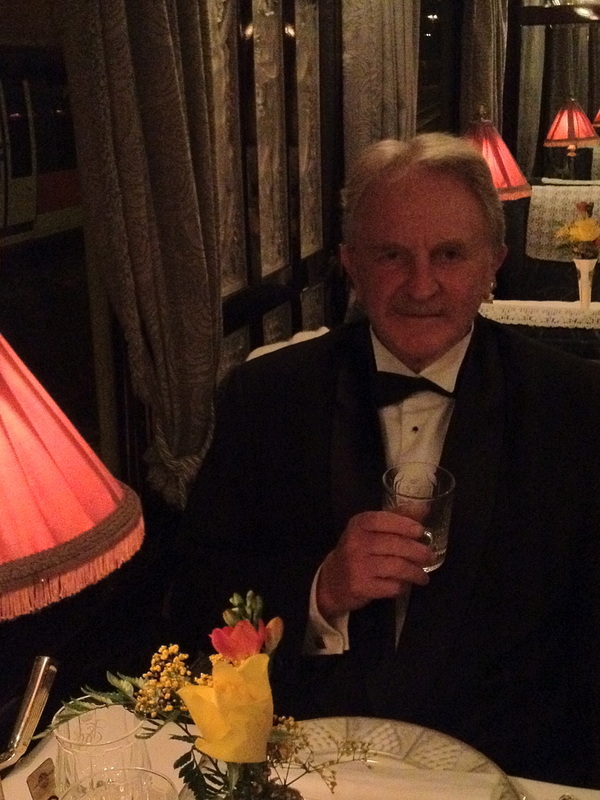 We start with a malt whisky and a glass of Moet. Margie has a crab veloute with caviar & crème fraise (this is very good made on a deliciously intense fist stock) and I have an interesting rocket salad with a soft yet sticky cheese (burreta), forest berries, sugar coated pecans and a light raspberry vinaigrette. Very good. Mains are a lamb for me and duck with rhubarb for Margie. The mains are good and well executed without being outstanding in either imagination, presentation or taste. The work on the sauce is first class in both dishes. Back in Australia this meal would have been considered a 15/20 at any top restaurant. We are eating early as we have tickets to a concert at St Nicholas Church in the Old Town Square. It is a 20 minute walk and we arrive just before the start of the concert. The concert features the Vilvaldi Orchestra Praga, a small string orchestra playing authentic baroque instruments and Yvona Skvarova, a mezzosoprano who is a soloist at the National Theatre. · Bach Concerto in A Minor, Allego-Andante-Allegro assai. · Handel The Fireworks …. The church is amazing and defies both my descriptive powers and the camera’s ability to capture the scene. Yvona Skvarova’s voice soars to fill the massive space with sound. I get the impression from the audience of 100 or so that it is an average Friday night’s entertainment. 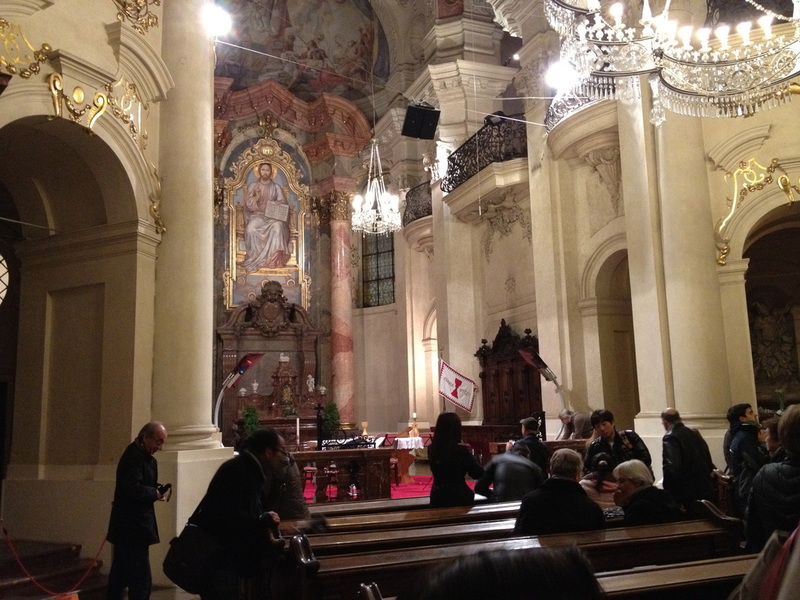 Tonight in Prague there are 3 or 4 such concerts within the Old City. We walk home totally oblivious to the light rain. We reboard the Orient Express at 2.00pm so we have a free morning in Prague. 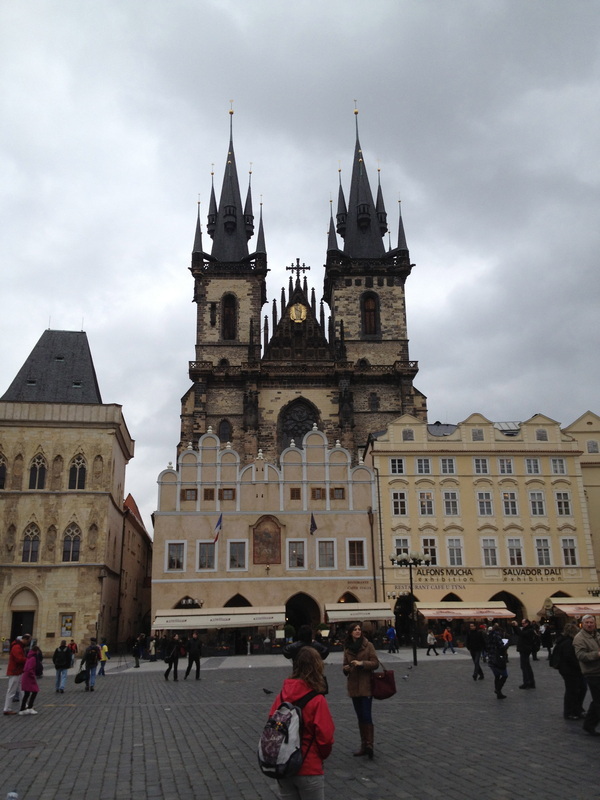 We decide to return to the Prague Castle which is just a short way up the hill from our Hotel. It is snowing. Wow we did not expect this but by the time we reach the Gallery there is a 100cm of snow over the cars parked on the roadside. 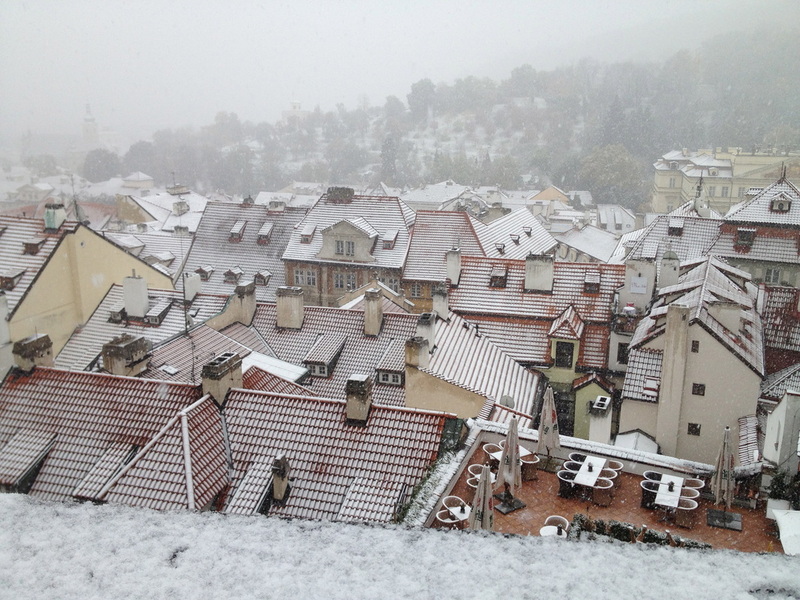 We visit the Gallery in the castle and when we emerge the roofs of the township are covered in snow. 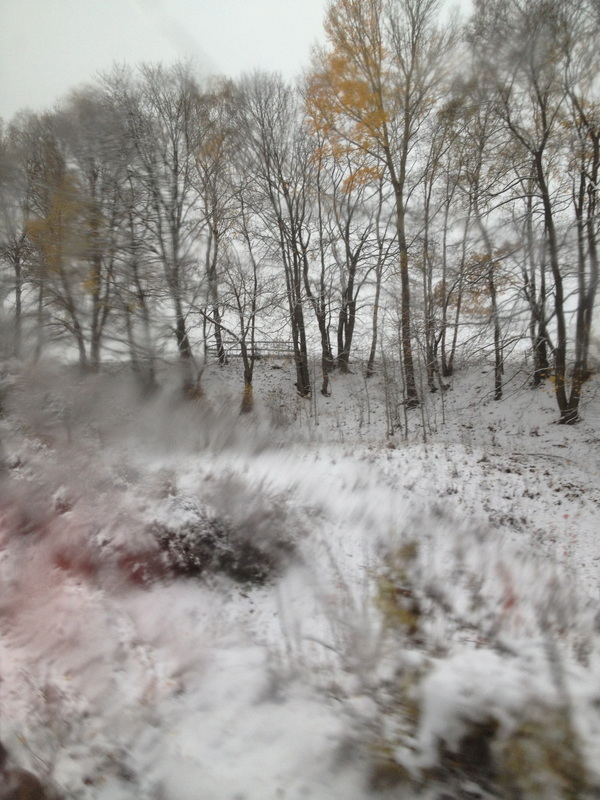 We reboard the train for Prosecco and afternoon tea as we watch the snow covered landscape fade into evening. It is amazing how quickly the weather has changed. A couple of days ago warm in Venice now snow covering the landscape. Again we have the late (9 pm sitting for dinner) and we meet David, Marie, Leon and Marie in the Bar. Tonight we have a table by ourselves and again the meal is outstanding. Back to the Bar Car and it is midnight by the time we head off to out bunks. We are up early and are served a light breakfast in the cabin by Micail. The snow is gone but the French countryside is glistering in a white frost. The Lenin Wall ...can they now dream?